In my last blog post, I talked about the future of marketing. I talked about the need to take risks and create opportunity. What does that mean? I think I can sum it up in three words—mix it up. Or two—stay interesting. Many companies think that being true to their brand means saying or doing the same thing over and over again. Not true. Your audience is not one homogenous, monochromatic, unilateral, single anything. Your audience is a mass of living, breathing, different human beings. You know what happens when human beings are presented with the same thing over and over again? They get bored. They stop responding to you and go looking for something interesting. So what’s a marketer to do? Mix it up. Do different things. Oh, and FYI, marketing the same message in different media is not doing different things! It’s merely doing the same thing differently. Don’t get the two confused. Sending the same messages out through different channels simply means that you’re using different ways to reach your audience. The question is: What are you doing to keep them interested? The New Coke disaster made too many marketers afraid of change. Companies decided to be comfortable rather than creative. But what does this comfort translate to with your audience? Say it with me—boredom! My point? Apple did it their own way. They knew their brand and their customer and acted proactively. And when something didn’t work (their first attempt at TV), they went back to the drawing board to find something better (iPod, iPhone, and now Apple TV). Your competition is not just companies selling the same products. It’s any company trying to reach the same audience you are. Learn from them. A coffee shop and a bookstore. They’re not competition but their audience does share a similar demographic. Borders knew bookstores were in trouble. Starbucks was successful at selling overpriced coffee, customer retention and growth. Borders was smart enough to realize the similarities in audience and add cafes—with the help of Starbucks. Will that move alone save them? No. But that type of thinking will. Where else does your customer go? Who else does your customer favor and why? What can you do to appeal to that favor? Answer these questions and change the actions you take without changing your brand, except for maybe making it stronger. Cynics, you might be thinking, “Oh, these companies just do these things to try to stay alive.” Yes, that’s exactly what they’re doing. After all, how do you stay alive? By continuing to please and interest your customers. How do you please and interest your customers? By keeping things interesting while staying true to your brand. That was the theme of a microconference that took place November 16, 2010. Nothing earth-shattering was revealed, but it was interesting to hear so many different views—60 views, to be exact. I liked this idea so much I thought I’d give my own 60-second take on the future of marketing too. Companies used to be able to get away with doing the same thing over and over. Not anymore. Multiple marketing channels and fast-changing technology means companies need to be able to move quickly and be comfortable with change. Advertising and marketing are no longer about who can spend the most money but about who can move the quickest to be where their customers are or will be. Marketing will be less about rigid campaigns and more about creating and reacting to opportunity. More gains will be made by those who are willing to be bold and take risks. Not outrageous risks, but risk doing something different. In this age of social media, we have more data than ever before about our audience. It’s time, past time, to use that information and really understand the audience—connect. Know your audience enough to be where they will be and to offer them what they need before they even realize they need it. In one word, the future of marketing is about opportunity, and it’s our job to take advantage of it. In the Future of Marketing Conference, Rohit Bhargava spoke about the need for marketers to stop speaking in jargon and corporate-speak and start speaking in “human” terms. As a plain language advocate, I was very happy to hear this. So, in return, I’d like to highlight his blog this week: The Influential Marketing Blog. Mayhem. That’s what can happen when an unfunny industry decides to advertise with a sense of humor. 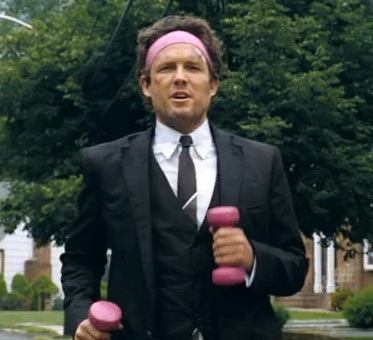 Allstate, however, seems to have the right formula with their Mayhem character. Humor can be tricky. Mayhem easily could have gone too far and become like the creepy Burger King guy. Or tried too hard and flat out failed at being funny. Allstate easily could have tossed Dennis Haysbert and relied solely on Mayhem. But they were smart and didn’t throw away their trusted voice. After all, they weren’t changing their brand. They were changing their commercials. Here’s what I like even more: Allstate wanted something different and the Leo Burnett agency proved you don’t have to go to a new agency to get fresh ideas. In fact, Leo Burnett has created Allstate advertising for more than 50 years. I have to admit, I wanted to hate Mayhem at first. But he’s grown on me. How can you not like a guy wearing a pink headband? These ads are funny. Looking for something to keep you laughing? Try two of my faves—The Onion and The Oatmeal. A call to action is more than just a chance to get your reader to act. It’s also your chance to leave your prospect with one lasting impression. Ever go to a movie that draws you in, draws you along and then just ends? (Ahem… Hereafter.) What do moviegoers then do? They complain about the movie. They decide not to see another movie starring that actor or directed by that director. In short, they leave. Just like a bad ending in a movie, a bad ending—or no clear ending—in your marketing materials can send your audience away. 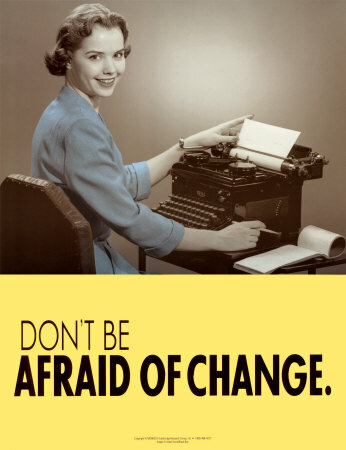 This means your flyers, brochures, e-mails, web pages, etc., all need some sort of call to action. “Read my blog.” That’s a call to action—a direction you’re asking your audience to take. “Register now.” “Enroll today.” See how easy it is? Too many marketers are missing this opportunity. They spend time and money creating all sorts of marketing materials, but only apply a call to action to a few. I guess that’s okay if you like throwing money away. But if you prefer to make money instead, think about your call to action right from the start. What do you want your audience to do? That one question should drive every step you take. Your call to action should drive that message home. 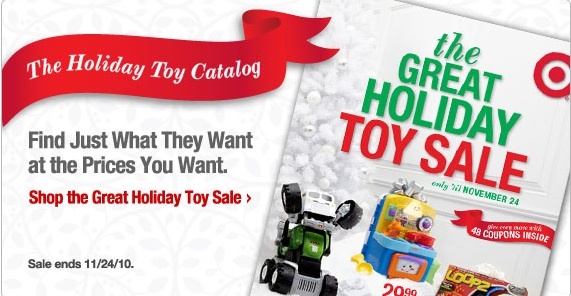 As you can see, Target’s call to action has all four. Plus, the sale end date gives a sense of urgency to get customers to act quickly. Don’t assume that your readers know what you want them to do. Your job is to make things easy for them. Give them reasons to act. Show them how to act. Remember, it’s great that you have a strong beginning and a good middle, but you also need a compelling end. Compel your audience to act now. Get 10 tips for effective calls to action. Read more about calls to action here. Can your brand draw in 200,000 people without telling them what they will get? Everybody talks about brand loyalty. Does being a fan translate to being a customer? Do “likes” translate to dollars? How do you get customers? How do you keep customers? Well, maybe it’s time businesses start taking some cues from Jon Stewart and Stephen Colbert. We didn’t know what Stewart or Colbert was going to do. We didn’t know who was going to join them (though a few names—Sheryl Crow, The Roots—leaked out). But we went anyway. Stewart and Colbert drew people to the rally because of their trusted brand. Fans of each show know that both men are consistent (and consistently funny) on their respective shows—The Daily Show and The Colbert Report. We trusted them to stay consistent and deliver something the crowd could support and stay interested in. The rally’s message—to bring back sanity to sociopolitical conversation—is one that everyone could get behind. 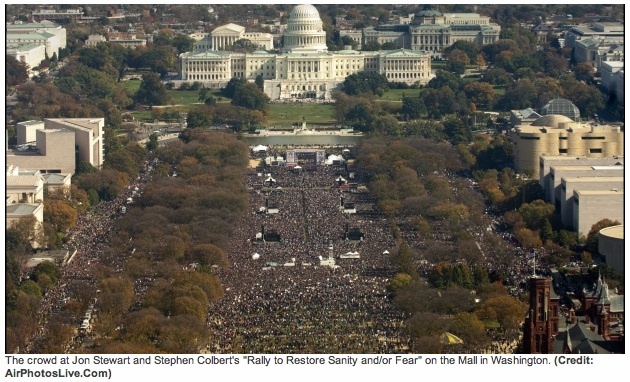 That one unifying message, and the fact that we knew Stewart and Colbert would bring us another good show, was enough for hundreds of thousands of us to travel to Washington DC. People flew in from Montana, Wisconsin, Texas, California—even Canada! We came in buses from Oklahoma, New York, Pennsylvania and more. What brand could get their audience to go to such lengths? And have all of those people walk away satisfied? Stewart and Colbert were able to accomplish this because they love what they do and they love their audience. They know their job is to give to their audience. Think about that. Think about all the companies that expect people to love them without giving anything in return. These companies expect people to spend money on their products and services without feeling special or getting much in return. At the rally, Stewart and Colbert surprised the audience with happy treats all afternoon, including some unbelievable cameos. Ozzy Osbourne, Yusef Islam (Cat Stevens) the O’Jays, John Legend, Kid Rock, Tony Bennett and even Kareem Abdul-Jabbar popped in. We never knew what was coming next—in a good way. Stay true to your brand so people know what to expect. Rally people around a unifying message or promise. Surprise your customers with pleasant treats as many times as you can. And hey, if you’d like to hold a free concert for us every now and then, that would be great too. If you weren’t at the rally, go here to catch up on videos. Check out Jon Stewart’s closing speech. Or go here to see many of the signs people made. Don’t forget to get out and vote…sanely. Vote for people, not for party.